Tama lives on a beautiful Pacific Island. He and his nanny spend time gathering seafood from the coral reef that fringes their island. But Tama and the villagers are facing a one major problem climate change where global warming is slowly sinking his island. When the villages have to be evacuated, Tama's nanny refuses to leave. She was born on the island the same night a storm shipwrecked the Stuck There Forever Boat there and will only leave when the boat leaves too. Will Tama be able to do to resolve this situation and convince his nanny to leave with them? "Beautiful story .... this book is another indication that sometimes a story conveys more than facts." Note: The New Zealand Pacific Picture Book Collection is a collection of 36 picture books nominated by nine librarians based in New Zealand with specific responsibility for providing library services for Pasifika communities in New Zealand. 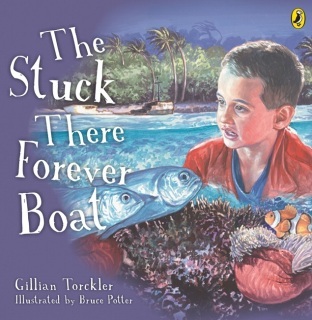 "While its subject is not an easy one for children, The Stuck There Forever Boat manages to end on a hopeful note by focusing firmly on the successful evacuation of the main characters from their island." 'This book was recommended by the NZ Voluntary Service Abroad and the NZ Girl Guides Association for Pippins and Brownies to read about children in another country to understand about their lives."